they look happy and content in that greenery. You can never have too many cows. Beautiful pic, It looks like they have lots to eat. I love cows!!! They look quite busy here, with all the grass to munch. What a lovely rural scene! A beautiful scene - and so warm! Lovely palatial view. Stunning sky and such billowy clouds. Perfect rural landscape. Very colourful. The blues and greens work so well together. Nice shot, Misty. A very pastoral scene. Wonderful rural scene, I love the cows. I seem to love any kind of critters. Great shot! Have a happy weekend! Looks like a bovine convention. That is a lovely shot! What a beautiful shot Misty! 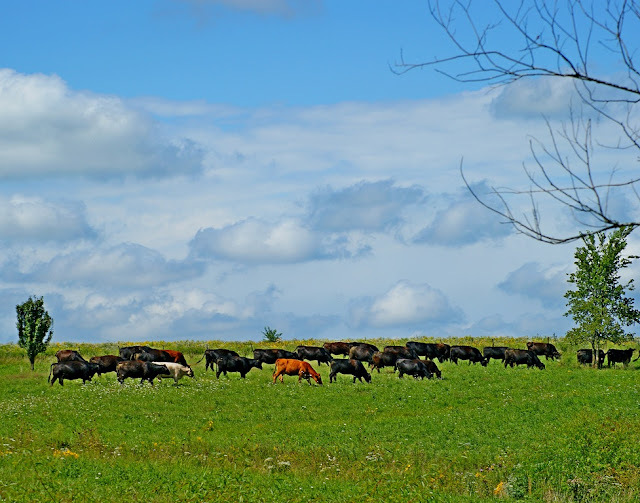 The cows in perfect positions and the brown one in the middle, the blue sky with dazzling clouds and the wonderful green grass. Thats art! What a beautiful country scene! That's a lot of cows, i guess they are fattening cows as they don't have the designs of the dairy cows. I wonder why there are only 3 different colors. Thanks for commenting in my blogsite. Great photo! I love cows, such curious animals. I remember walking across a field once, sitting down for a rest and all of a sudden finding myself surrounded by a herd who just stared at me until I went on my way. At first it was a little unnerving then I saw the funny side.